I have been MIA a little bit but I have some good excuses LOL. Let’s see…I am on fall break which consists of no school for Monday and Tuesday of this week. I actually only have to go to school only one day this week which is absolutely awesome! I don’t have class on Wednesdays. Thursday is my home health clinical day and Friday’s class is cancelled (but I do have an assignment to do to make up the time lost). So the reason I have been MIA…..I have had lots of tests and projects to do and plus school is keeping me wore out. This past weekend I was so tired that I barely got out of bed which when I did it was to eat or use the bathroom. I was extremely lazy that I thought I might be coming down with something but it was just from being over worked! But now I feel revived and have been getting some stuff done. I had to do my nursing care plan during the break and study for a test I have next Monday (they just keep laying it on ya). Overall, I am doing really good in my classes and everything is going smoothly. I just can’t wait til Christmas break which is in about 6 weeks…I think and only several more months before I finally become a Nurse. So guess what Ben and I did, we bought a Nintendo Wii lol. Now I am so cool! Okay granted I am a little too old to be playing video games but trust me the Nintendo Wii is for everyone regardless of age. It is so so much fun! It is like you are actually in the game. You have to use muscles that you never thought you had. I played it so much yesterday that my arm and back muscles are killing me….as I write this blog post I have a heating pad on my back to help with the ache. I swear if I take deep breaths my back muscles start to ache. 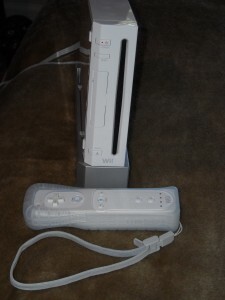 The Wii came with a sports game that consisted of bowling, golf, tennis, boxing, and baseball. My favorite is bowling! It actually feels like you are bowling. I LOVE it. Tonight we are going to play Mario Galaxy LOL I am such a nerd 🙂 The only catch to buying the Nintendo Wii is that we are not going to buy each other any Christmas gifts, Wedding anniversary gifts (which is in January), or Valentine’s Day gifts because it did set us back a little bit. Here is our little ole’ Wii (It is small…I thought it would be bigger): The thing beside the system is called the Wii mote….isn’t that clever. Say it aloud LOL!! Oh yeah, just to prove to you it is for everyone regardless of age….during my clinical rotation at the nursing home they had the residents playing the Nintendo Wii for exercise. They really liked it and these residents are in their 70s, 80s, & 90s. So there you have it! I hope everyone has a great week!